I’m a Dutch photojournalist (born 1981). I studied photography in Bradford in the UK and at the Royal Academy of Arts in The Hague, where I graduated in 2003 with a project about the amber-hunters in the Russian enclave of Kaliningrad. I prefer to work on long-term projects and see stories develop. I’ve mainly focused on countries from the former Soviet Union, Afghanistan and on migration/refugees. Between 2010 and 2015 I lived in Afghanistan after which I moved to Ukraine where I live now. What specific challenges as photojournalists do image makers face in conflict zones? Obviously as a visual journalist you have to be very close to the action, generally you can’t take photographs after the facts. Taking a photograph can also be intrusive, especially when people find themselves in difficult circumstances or in harm’s way. 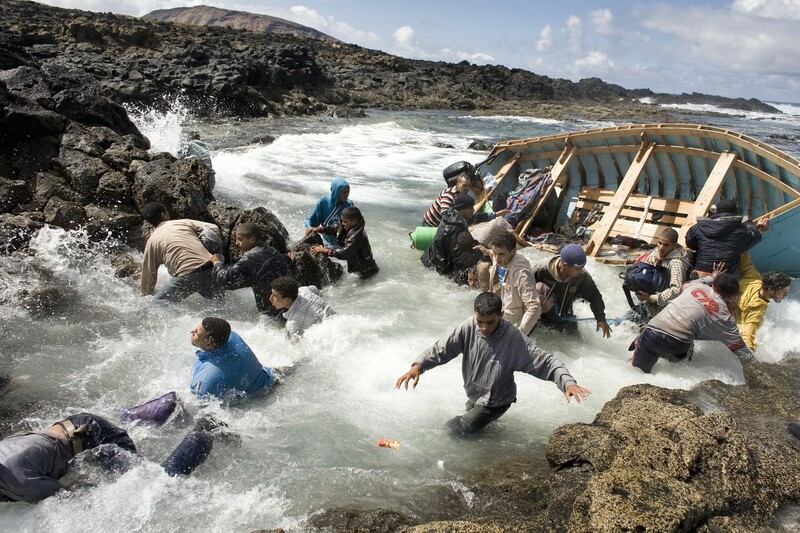 Young Moroccans arrive illegally in Spain. After sailing the Atlantic Ocean for more than 30 hours, they arrive on a small island north of Lanzarote and are arrested within one hour. What kind of conflict zone training do you have? Have you taken a HET course? I received on-the-job training in Afghanistan. I spent quite a bit of time with Pararescue Jumpers as well as other medics in the country — enough to feel confident about the ‘training’ I received. But I’m always looking for more ways to learn, especially medical knowledge, and plan to take a course in the future. 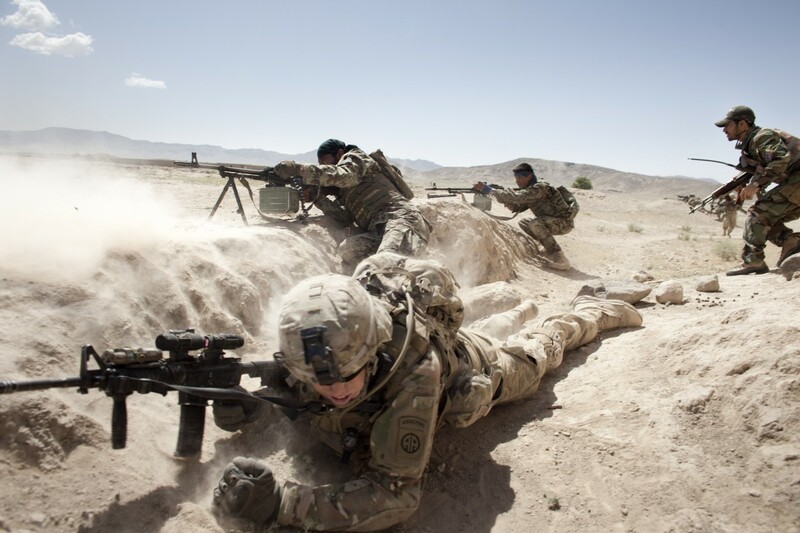 An Afghan soldier returns fire while an American paratrooper takes cover in Giro district, Ghazni province, Afghanistan. How do you prepare for an assignment? This really depends on the assignment. My general interests focus on the human condition; I would never call myself a war photographer. Knowing beforehand about where and who I’ll be photographing is key, but I want to know just enough so I can still work with an open mind and without too many preconceived ideas. The stories I do in countries where I’ve never been always turn out quite differently than expected, but I like that. 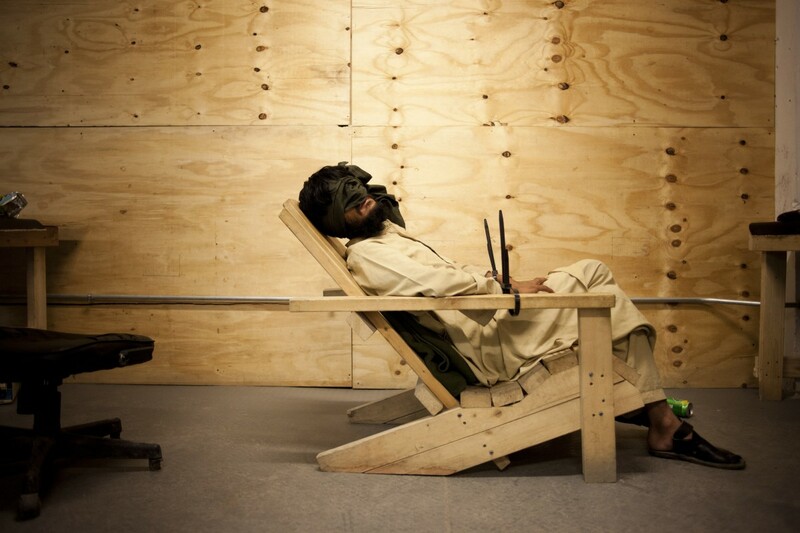 A suspected member of the Taliban is blindfolded and tied to a chair in the US Army’s and ANA’s tactical command room of Combat Outpost Monti, on the day that he and another suspect were caught in the village of Asmar by the Afghan National Army. Combat Outpost Monti is located in the northern Kunar River Valley, about six miles north of the district capital of Asadabad and close to the border with Pakistan, eastern Afghanistan. 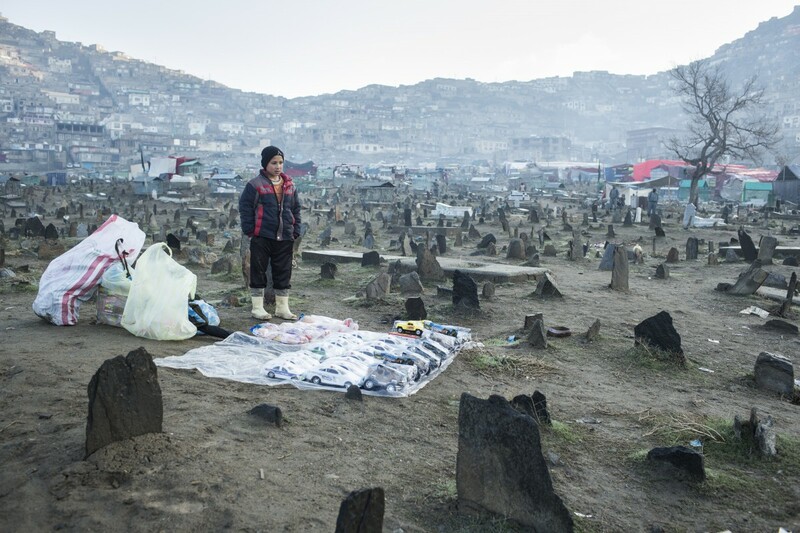 A young Afghan boy waits for customers to sell his toys from his makeshift shop in a graveyard, early morning on New Year’s Day. On March 21st, 2013, Afghans celebrated the Persian New Year, Nowruz, welcoming the year 1392. Tell us about your favourite gear and why. For pictures I like to work with a rangefinder and a 28mm lens, a camera that is not too intrusive, I prefer to walk around with not too much gear. I like the field of view of a 28mm and it forces me to be close to the people I photograph, I also carry a 50mm in my pocket. Lately I’ve been working with a Fuji X Pro 2. These days for many clients I’m shooting video as well, which makes ‘working with not too much gear’ kind of complicated. 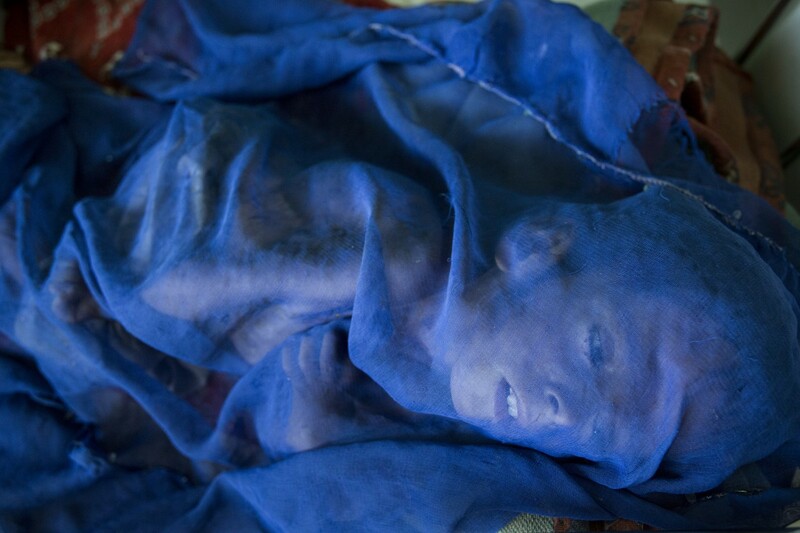 Khial Mohammad, a 6-year old boy suffering from severe malnutrition, lies under a net to protect him from flies. His grandmother is looking after him in Bost Hospital in Helmand’s capital Laskar Gah, where MSF is providing medical care. She says there were no men in their village to accompany her to the hospital earlier. The young boy does not have a big chance of surviving. You were born in the Netherlands, spent long stints based in Ukraine and Afghanistan, and are currently in London. How many languages do you speak? How does knowing the language affect your approach to an assignment? I guess Dutch and English fluently, and to some extent German, Dari and Russian, not enough to do proper interviews, but sufficient to chat with people and work without translators. I prefer to stick with stories or people for longer, learning at least some of the language, which I did throughout my five years in Afghanistan. I feel this approach gives my work a depth I otherwise wouldn’t be able to reach. There is always a barrier to making a profound connection if you have to speak with people via someone else or an electronic device. 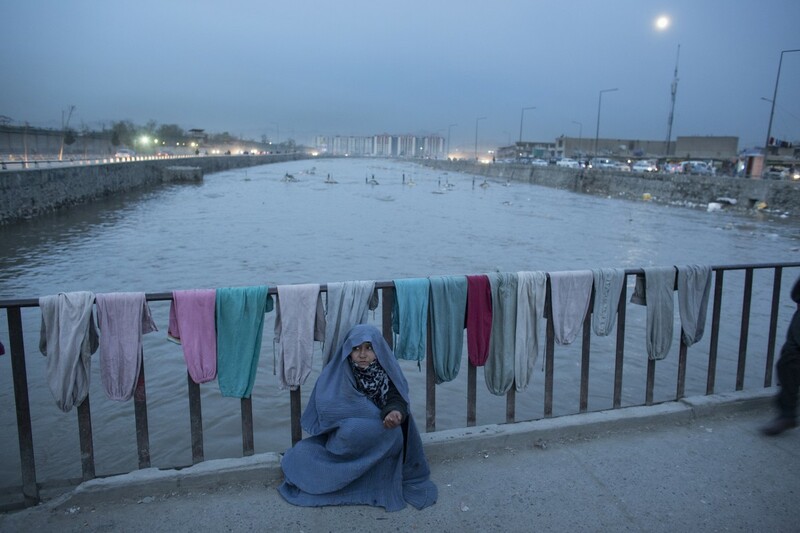 Every day Shabana comes to this bridge over the Kabul River to ask passersby for some money. The 14-year-old lost her father 7 years ago and has no siblings. Her only family is her mother. At the left is the ministry of defense. Have you ever faced an ethical challenge in the course of your work? How did you handle it? Often, yes of course, for example when I posed as a refugee in Afghanistan and Indonesia. We chose this approach because it would have been impossible to deal with the smugglers and tell the story of the refugees accurately. But obviously this gave us challenges, some ethically. I always try to stay respectful to the people I photograph and honour their story. I strongly believe in the ethics of photojournalism, and will for example never be tempted to ask someone to do a certain thing or to change a scene. Afghanistan, Wardak, November 4, 2012. 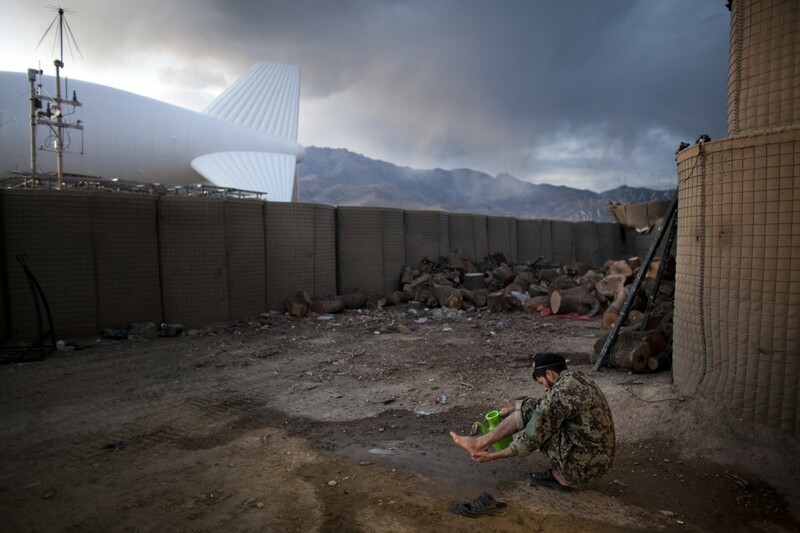 An Afghan soldier takes ablution before evening prayer near the surveillance blimp at Combat Outpost Dash-e Towp, in central Wardak Province. The blimp is on the ground at the American side of the base. Describe your favourite image. What keeps you shooting? Often my work consists of a series of images, and it’s important how these work together to tell the story. I’m not looking for that one picture that shouts a single message but more for a subtle, layered approach with room for interpretation and reflection by the viewer. 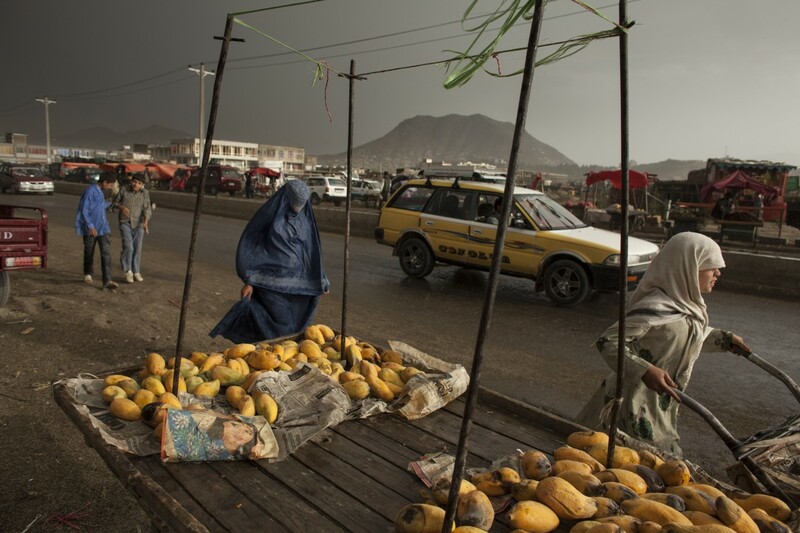 A burqa-clad woman walks past a push-cart selling mangoes during a summer rain on Thursday, as the city prepares for Friday, the holiest day of the week. A common misconception about conflict zone photographers is…. That they are all scarf-wearing adrenaline junkies. Got any advice for budding photographers? Try to learn different languages, especially if you’re interested in working in a specific area or country. Like I said earlier, being able to communicate with the people you photograph will give you so much more depth to understand their story. If I could start over I might have tried to study Arabic for example, instead of going to the academy of arts. 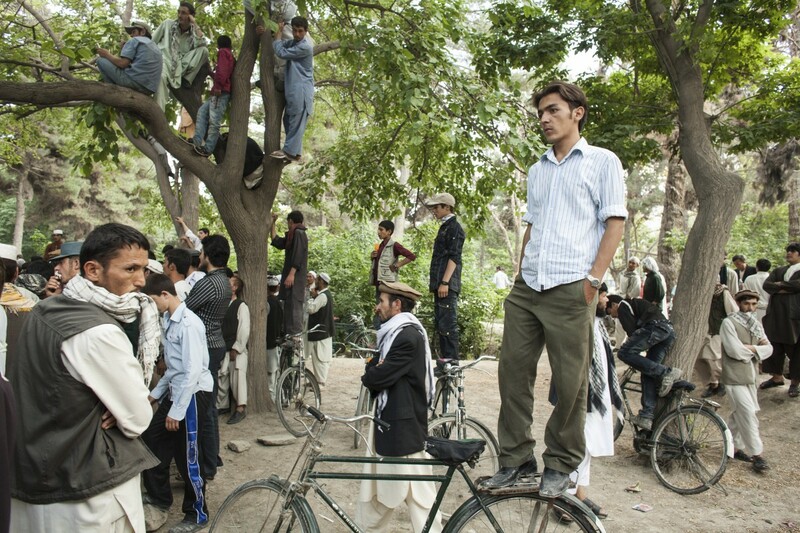 Afghan men watch a wrestling match on a Friday in Shar-e Now Park. Also, practically, as a freelancer and working on a small budget it makes quite a difference when it comes to the costs of hiring interpreters. 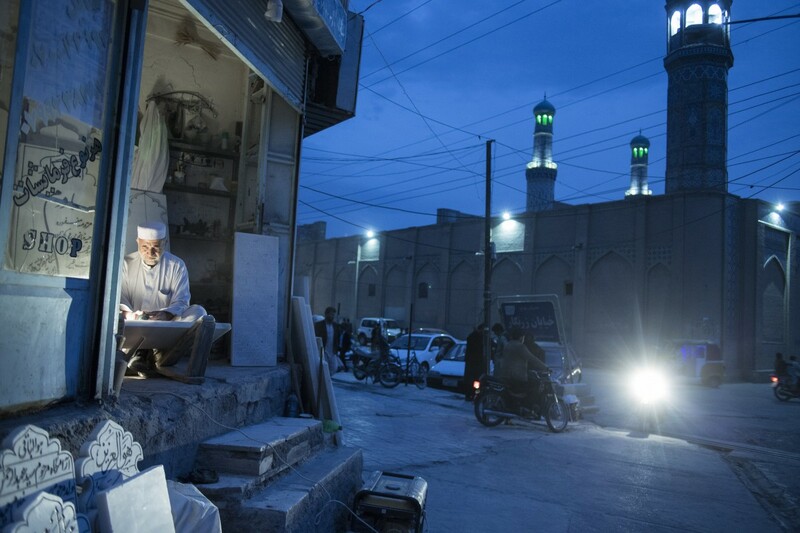 A worker engraves a gravestone while dusk falls over the 800-year-old Great Mosque of Herat, western Afghanistan. Tell us about your most recent assignment or work. Recently I went to Chernobyl for the Guardian’s Weekend Magazine. We followed a Polish Virtual Reality team who are producing a VR-tour of the exclusion zone, 30 years after the nuclear disaster. I found it truly amazing to have the opportunity to walk around an abandoned 1980’s Soviet supermarket and meet some of the resilient elderly returnees.